MINNEAPOLIS – It was arguably the most magical 5.9 seconds of the 2019 NCAA Tournament, a play where everything had to go exactly right for Virginia to survive the blizzard of three-pointers by Purdue’s Carsen Edwards and earn a trip here for the Final Four. The heroes of that short moment in time were freshman Kihei Clark and redshirt junior Mamadi Diakite. 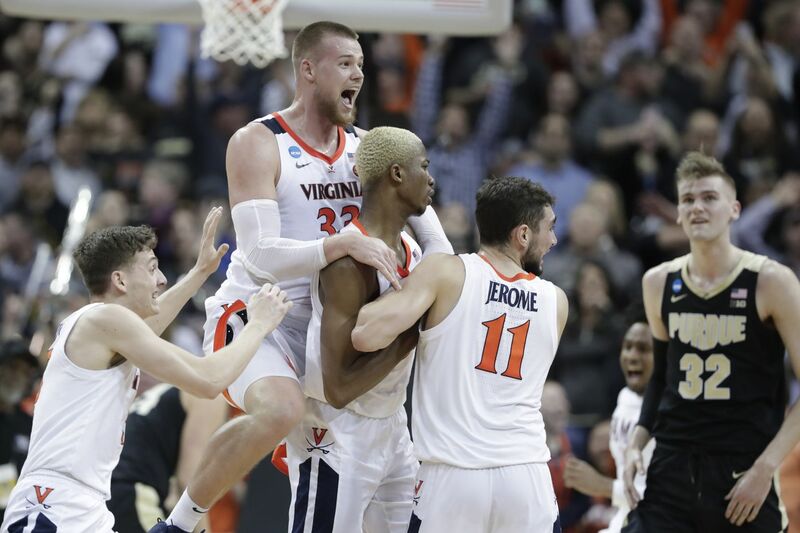 Clark chased down the tap-back of Ty Jerome’s missed free throw in his backcourt and one-handed a 45-foot pass on a rope to Diakite, who sank a 10-footer at the buzzer to force overtime in the South Region championship game that the Cavaliers would win, 80-75. The shot has elevated the 6-foot-9 Diakite, from Conakry, Guinea, on the western coast of Africa, to hero status at home -- or at least that’s what he’s heard. “My cousins told me that if I go back home right now, the whole population would welcome me home, which is very amazing,” Diakite said Thursday at U.S. Bank Stadium, where the Cavaliers continued to prepare for Saturday night’s national semifinal game against Auburn. Diakite, who dyed his close-cropped hair blond in February, has enjoyed the moment. The perfect technique on his shot, catching Clark’s pass and going up in one motion, allowed him to beat the buzzer. If he caught the pass and brought the ball down to get in shooting rhythm, the buzzer would have sounded before he got the shot off. Virginia coach Tony Bennett said he did not tell Jerome to miss the second of his two free throws with the Cavaliers trailing, 70-68, “because I thought there was enough time if he made it” to get a steal or foul for one more possession. What he saw, however, had to be magic. “Given the circumstances and what was on the line, it was unreal for the presence of mind of Mamadi and Kihei -- Mamadi to tap it [back], Kihei to chase it down to make that pass," he said. He has done that, averaging 13.0 points and 9.0 rebounds in Virginia’s four NCAA games. He said he is proud to now be on the same stage as other African-born players, such as Hakeem Olajuwon of Houston and Udoka Azubuike of Kansas. Bennett is undoubtedly happy for Diakite, but he is letting his players know it’s time to put last weekend’s heroics aside and look ahead.